Workers sitting next to the controversial lamp post in Magnitogorsk. 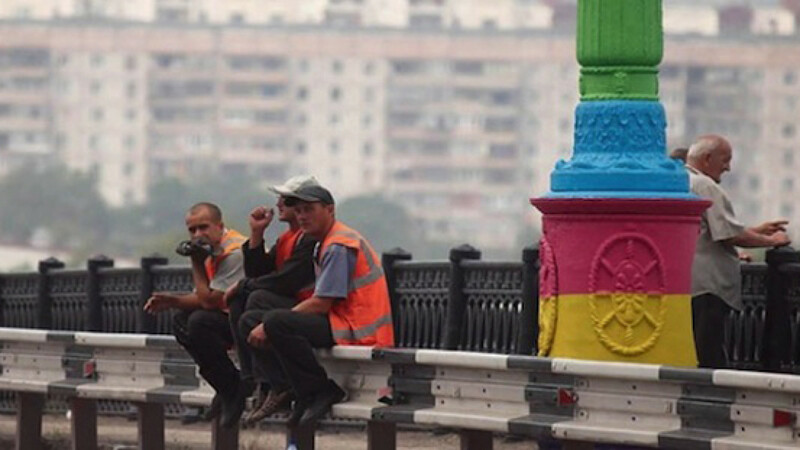 Chelyabinsk region prosecutors have responded to a request from a concerned citizen about whether a lamppost painted in rainbow colors in the city of Magnitogorsk could be legally considered gay "propaganda," assuring the person that the lamp was not violating the law. "The sequence of colors on the lamppost does not constitute propaganda of nontraditional sexual relations among minors and does not carry any harm to children and their development," the prosecutors said in their response. Despite the lack of a clearly defined role for precedent in Russia's civil law system, the lamppost case could represent an important signal for future decisions by law enforcement bodies on similar issues. Yevgeny Dubrovsky, who submitted the request, told news website Russkaya Planeta that he was not a "homophobe" and filed his inquiry in order to "see how the law works in practice." In June, a law was passed banning loosely defined gay "propaganda" among minors in Russia. Outraged LGBT activists across the world have since argued that the law effectively prohibits all expressions of homosexuality, including wearing or carrying any garments or items with rainbows in public. The lamppost in question is installed on the middle of a bridge that supposedly marks the border between the continents of Asia and Europe. It bears a sign that says travelers are leaving Europe and entering Asia. According to local authorities, the lamppost was painted different colors following a newly adopted branding scheme developed for the city. Its color scheme contains five colors: yellow, pink, green, blue and purple. The rainbow flag designed by artist Gilbert Baker in 1978 for a San Francisco gay pride parade has six colors: red, orange, yellow, green, blue and purple. Nonetheless, the district's deputy prosecutor said that even if the lamppost was painted those colors, it would still be legal.